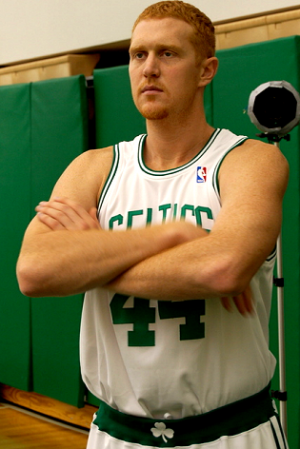 Brian David Scalabrine was born on the 18th March 1978, in Long Beach, California USA, of part-Italian descent, and is a retired professional basketball player, who is probably best recognized for playing in the position of forward in the National Basketball Association (NBA) for such teams as the New Jersey Nets, Boston Celtics, and Chicago Bulls. He is also known for being an analyst for the Boston Celtics. His playing career was active from 2001 to 2012. So, have you ever wondered how rich Brian Scalabrine is, as of early 2017? According to authoritative sources, it has been estimated that the total size of Brian’s net worth is over $10 million, an amount which has been accumulated not only through his career as a professional basketball player, but also through his latter career as a television basketball analyst. Brian Scalabrine was raised with three siblings in Enumclaw, Washington, where he attended Enumclaw High School. There, he began to play basketball, and upon matriculation in 1996, he enrolled at Highline College, where he continued playing for the college team – the Thunderbirds. In his freshman year, he led the team to win the state junior college championship, so he was named a Northern Division All-Star in 1997. In the following year, Brian transferred to the University of Southern California (USC), playing with the USC Trojans, clearly distinguishing himself as he was the 1999 Pac-10 Newcomer of the Year, and earned All-Pac-10 honor. As a senior, he was named to the All-Pac-10 first team, as well as winning a Sporting News All-American honor. He graduated from the college with a BA degree in History. Brian’s professional basketball playing career began when he was selected in the 2001 NBA Draft as the 34th overall pick by the New Jersey Nets, so he signed a rookie contract, which marked the beginning of his net worth. He made his debut in 2002 in the game against the Milwaukee Bucks; as a rookie, he averaged 2.1 points, and 1.8 rebounds per game. In the 2001-2002 season, the team became the Eastern Conference Champions. During his time at the Nets, he became known under the nickname “White Veal”. In 2005, Brian was traded to the Boston Celtics, with whom he signed a contract worth $15 million over five years, which added a considerable amount to his net worth. During the 2007-2008 season, Brian appeared in nine games, averaging 1.8 points, and 1.6 rebounds. Partly thanks to him, the Celtics defeated the Los Angeles Lakers to win the 2008 NBA Championship. The 2010-2011 season Brian began as a member of the Chicago Bulls, appearing with the team in 18 games, and averaging 1.1 points, 0.4 rebounds per game, increasing his net worth. During the 2011 NBA lockout, Brian signed a contract with Benetton Treviso, an Italian basketball team, but when the lockout was ended, he returned, however he retired at the end of the year. Additionally to his playing career, Brian became an assistant coach for the Chicago Bulls in 2012, and later he became a commentator at Comcast SportsNet New England, increasing further his net worth. Two years later, he began to work as an analyst for the Boston Celtics. If to talk about his personal life, Brian Scalabrine has been married to Kristen Couch since 2003; the couple has two children. In free time, he is an active member of Athletes for Hope, a sports charity organization.